Lawsuits filed against Loy Clark Pipeline, Bremik Construction seek compensation for damages and injuries from October 2016 incident. An excavation company is facing a new round of lawsuits related to a series of explosions that destroyed one building and caused an estimated $17.2 million in Northwest Portland in October 2016. Among the most recent suits filed in Multnomah County against Loy Clark Pipeline Co. is one for $89,500 filed by Colony Insurance Co., as subrogee of Jason Kudell and his tattoo company Art Work Rebels. The suit, which was filed in Multnomah County, also names Bremik Construction and Northwest Natural Gas Co. as defendants. In October of last year, Loy Clark Pipeline was conducting excavation for a project being overseen by Bremik Construction when a worker struck and dislodged a natural gas pipeline, which led to gas escaping and migrating underground to a building on the corner of Northwest 23rd and Glisan. 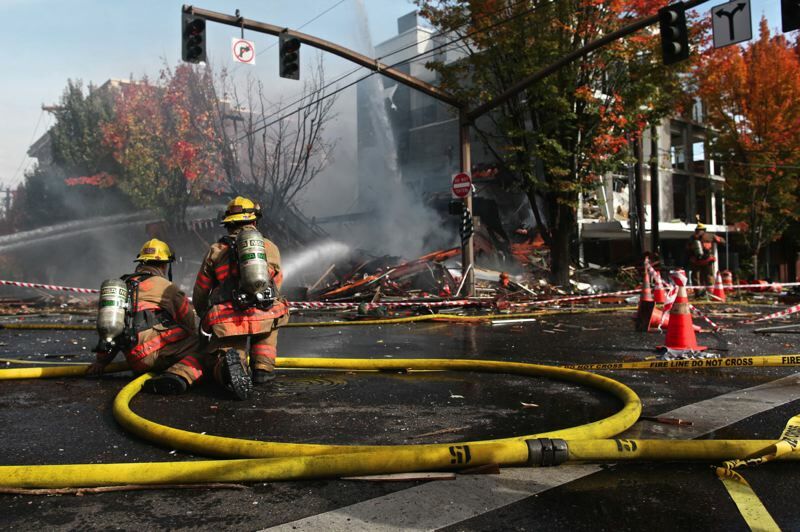 A series of resulting explosions destroyed a building on the corner of Northwest 23rd Avenue and Glisan St. that housed Portland Bagelworks and Fetch, an eyewear retailer. The explosions also caused broken windows and other structural damage to several buildings, including the one that housed Kudell's tattoo business. A report released last year by the Oregon Public Utility Commission determined the Tualatin-based excavation company provided officials with incorrect information about where it planned to dig for the project. Loy Clark Pipeline told the Oregon Utility Notification Center the excavation would take place on the south side of Northwest Glisan. Utility locations were marked in that area. But the company's crew actually began digging on the north side of the street, where utility locations were not marked. As a result, the company's workers hit and ruptured a Northwest Natural gas pipe. In April of last year, a woman who had been working in the area when the explosion occurred filed the first lawsuit against Loy Clark Pipeline. In her $689,000 lawsuit, she claimed the company's negligence caused the explosion, which resulted in her receiving a concussion, cuts from broken glass, and other injuries. More recent lawsuits against the company include a claim for $402,000 by an inspector for Northwest Natural and a suit filed by Moonstruck Chocolate for damage to its Northwest 23rd café. Earlier this year, Moonstruck Chocolate re-opened its brick-and-mortar space on Northwest 23rd. The company had been operating out of a food cart after the explosion. The renovated space now offers more room to show off the company's products as well as space for classes, and tasting and community events. There also are steps under way to replace the building on the corner of Northwest 23rd and Glisan that was destroyed by the explosions. In August, the city's Historic Landmarks Commission approved a plan for a new structure with 5 residential units and approximately 1,000 square feet of ground-floor retail space to be built on the site. Designed by Allied Works, the project is being developed by A&R Development, which also owns the adjacent Robert and Ann Sacks House. That building also was damaged in the explosion and is being restored. The most recent flurry of lawsuits against Loy Clark Pipeline were filed just before a two-year window closed for initiating legal proceedings seeking compensation for damages and injuries related to the Oct. 19, 2016, explosions. In its lawsuit, Colony Insurance Co. is seeking reimbursement for paying an insurance claim submitted by Art Work Rebels. In addition to $89,500 paid for damages resulting from the explosions, the suit requests compensation for attorneys' fees and pre-judgement interest. The suit alleges Loy Clark Pipeline and Bremik failed to "exercise reasonable care and failed to perform excavation services in a professional and workmanlike manner."